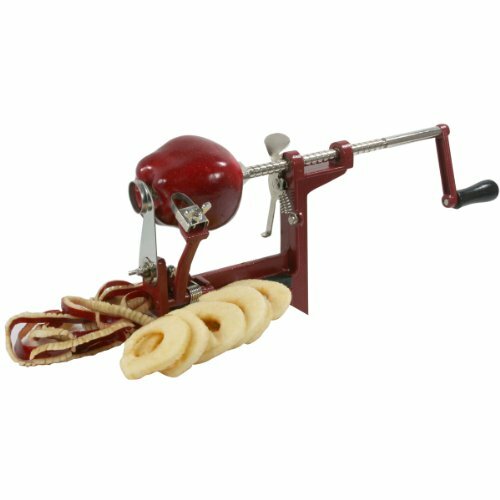 Enjoy more of the autumn apple harvest with the AmeriHome Hand Crank Apple Peeler. Take the family and kids out apple picking and make fresh apple pies, apple sauce and cobblers when you get home. The polished steel Apple Peeler makes it quick and easy to core, peel and slice an entire bushel of fruit. The Hand Crank Apple Peeler is easy to use. Just screw the zinc alloy base to any counter or table top not more than 1.5-inch thick. Slide the apple onto the 3-prong fork and rotate handle. The core slicer can be removed or added to make slicing easier and an adjustable flat blade makes paring easy. If you have any questions about this product by AmeriHome, contact us by completing and submitting the form below. If you are looking for a specif part number, please include it with your message.